FULTON – The Center for Instruction, Technology and Innovation welcomes a new school resource officer to the Fourth Street School in Fulton. 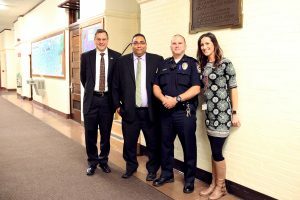 From left, CiTi Assistant Superintendent for Personnel Mark LaFountain, CiTi Principal Guy Linton, School Resource Officer Rick Hahn and CiTi Principal Erin Simmons. Partnering with the Fulton City Police Department, Officer Rick Hahn will be at the school Monday through Friday helping to enhance safety for all students, staff and visitors. Hahn brings nearly 15 years of experience from the police force. Part of his responsibilities as a school resource officer include providing a familiar and consistent presence in the hallways and classrooms, perimeter sweeps, assistance with drills and lockdowns and developing positive relationships with the students, staff and families. 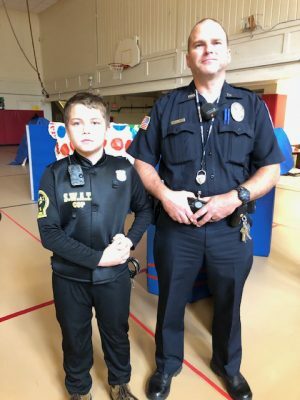 CiTi student Damion Bean dresses up as the new CiTi School Resource Officer Rick Hahn for Halloween.